Wages saw faster than expected growth in the three months to July, as they continued to outstrip rising prices. Excluding bonuses, wages grew by 2.9%, according to figures from the Office for National Statistics (ONS), well above the inflation rate. Earnings have now outstripped inflation for four months. Unemployment continued to fall, dropping by 55,000 to 1.36 million, with the jobless rate remaining at 4%, its lowest level for over 40 years. 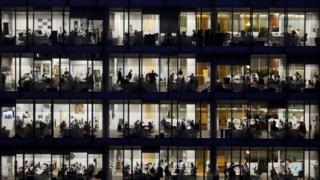 The number of people in work was unchanged at 32.4 million. The ONS said the labour market was "robust" with the number of people in work "still at historically high levels". "With the number of people in work little changed, employment growth has weakened," said the ONS's head of labour market statistics, David Freeman. The inflation rate for the three-month period to July was 2.4%, with the rate for just July slightly higher at 2.5%. Andrew Wishart, UK economist at Capital Markets, said the figures indicated that "competition for workers is finally starting to provide greater support to wages". "We still think that the MPC will hold off raising interest rates again until the near-term uncertainty due to the Brexit negotiations is resolved," he added. Ben Brettell, senior economist at Hargreaves Lansdown said the latest employment figures showed that the Bank of England was right to raise rates last month. "The Bank looks at wage growth as a key driver of inflation. "The problem is that if wages grow without corresponding productivity growth - as we've seen in the UK - it means more money chasing the same quantity of goods and services, which pushes up prices," he warned. Yesterday economic growth hit 0.6%, the best number since July last year. Today, incomes are up 2.9%, a figure that has not been bettered since July 2015. With inflation for the month of July at 2.5%, real wage growth (which accounts for price rises) rose to 0.5% between May and July. High levels of employment could finally be passing through to our incomes as firms compete for our work. It will take a long time to repair the damage to incomes over the decade since the financial crisis. But with economic growth stronger and the possibility of some form of Brexit deal rising, this is certainly better news for the economy overall. The Secretary of State for Work and Pensions, Esther McVey, said: "Since 2010 we have delivered significant growth in jobs, and in the last six months we've seen real-terms wage growth. "We haven't had a lower unemployment rate for over 40 years and I'm especially proud that youth unemployment is at a record low, falling by over 45% since 2010 - opening up career opportunities for our next generation." Labour's shadow work and pensions secretary, Margaret Greenwood, said: "Today's figures hide the real story of the labour market under this government: people are earning less than they did in 2008, and millions of workers are stuck in insecure jobs. "More families are working harder to get by, but the rising cost of living and low pay means that a job is no longer a reliable route out of poverty." The ONS said job vacancies rose by 14,000 in the period to 833,000 - a record high. Suren Thiru, head of economics at the British Chambers of Commerce (BCC), said this was "alarmingly high" and "further evidence of persistent skills shortages". "While the number of people in work stands close to historic highs, firms continue to report that attempting to recruit staff with the right skills is an increasingly uphill struggle, which is stifling their ability to grow and boost productivity," he added. Tej Parikh, senior economist at the Institute of Directors, said firms were now in heated competition for skills. "Vacancies are at an all-time high, and recruiters are finding it increasingly difficult to match available workers with job descriptions. "In these circumstances, we would normally expect significant increases to salaries as firms attempt to attract the talent they need, but high costs and subdued productivity growth have impeded this somewhat," he added. Mr Parikh urged the chancellor to act in the forthcoming Autumn Budget to help provide reduce costs for businesses.